We are closing out 2017 as another great year for USMMA. In November, the Academy received full reaccreditation from the Middle States Commission on Higher Education. This milestone was made possible by the combined efforts of Midshipmen, faculty and staff and with the support of the Maritime Administration, the Department of Transportation, and the Congress. 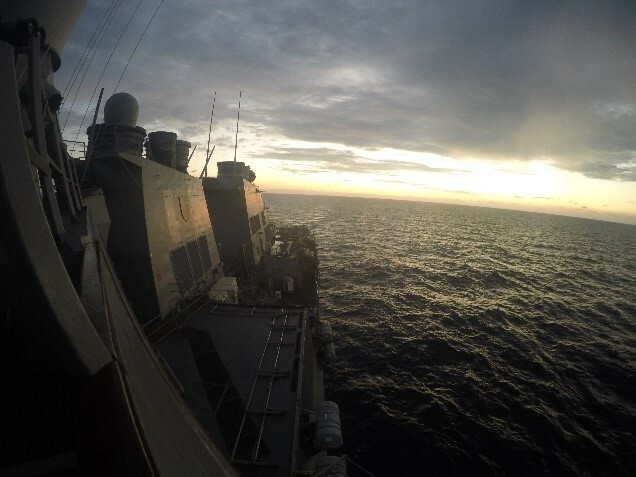 Sailing on commercial vessels resumed in the spring, and as I write this over seventy percent of Midshipmen at sea are on commercial ships around the world. We opened a new Midshipman fitness center in the renovated Zero Deck, just one part of our on-going efforts to improve facilities and quality of life for Midshipmen. Midshipmen-athletes represented Kings Point with pride at the national level. 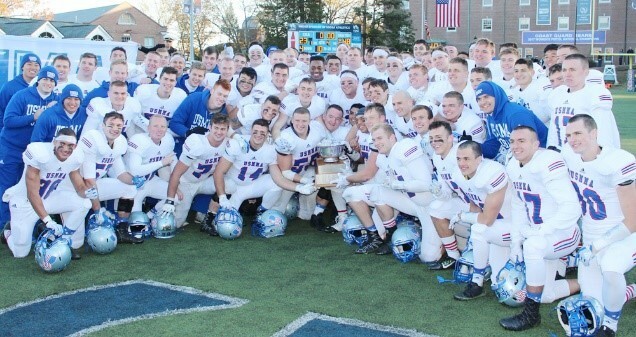 The football team won the Secretaries’ Cup, which was broadcast nationally on ESPN3. They followed up with an upset win in the Chapman Bowl, capping a most successful winning season. Women’s volleyball won the Skyline Conference championship and concluded their 2017 campaign with their first appearance in the NCAA tournament since 2002. Congratulations to all of our players and coaches on their significant accomplishments! And as we get ready for the winter break, the 40th Festival of Lights showcased the musical talents of the Regiment and put us all in the holiday spirit. We have so much to be proud of here at USMMA. 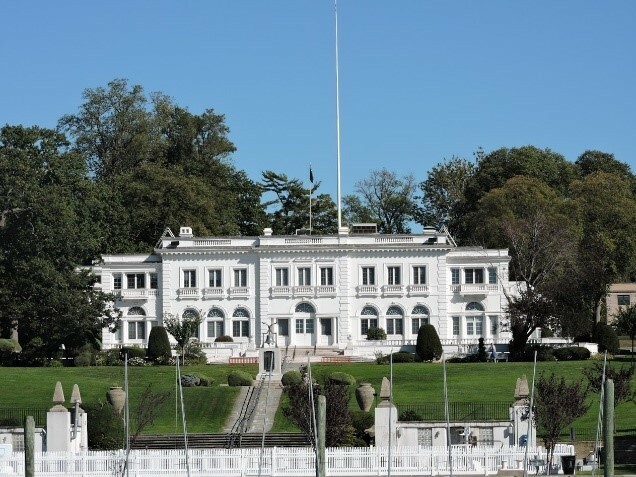 Kings Point is a national treasure, a critical institution that serves America’s needs in peace and war. All of us are blessed and privileged to be part of the Academy and its mission. I wish all of you and your families a joyous holiday season. To those Midshipmen who will spend the holidays standing watch around the world, I am proud of you and wish fair winds and following seas. 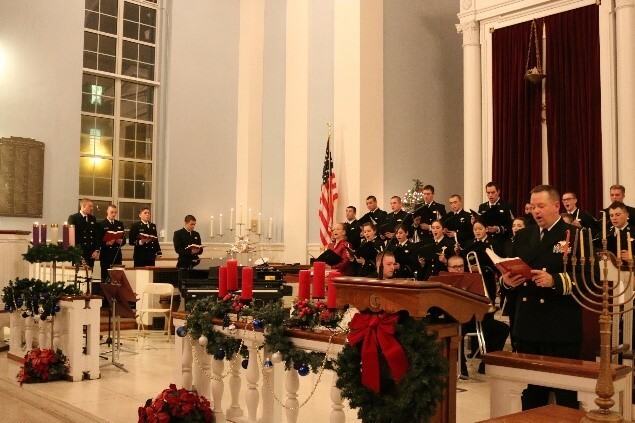 On December 11th, the United States Merchant Marine Academy hosted its 40th annual Festival of Lights in the Mariners’ Memorial Chapel. The Festival of Lights is an interfaith celebration that has become a beloved tradition at USMMA. The Middle States Commission on Higher Education granted the US Merchant Marine Academy full reaccreditation on November 16, 2017, after determining the institution meets the commission’s rigorous and comprehensive standards in displaying characteristics of excellence in higher education. On December 1st, USMMA hosted a ribbon cutting ceremony to celebrate the reopening of the newly renovated Zero Deck and Midshipman Fitness Center. Zero Deck is the underground walkway that provides an avenue for traversing the entire below-grade level of all six barracks and Delano Hall in a safe and secure environment, especially in the event of inclement weather. On Monday, United States Merchant Marine Academy Superintendent, Rear Admiral James A. Helis, Commandant, Captain Mike Stroud, and Interim Academic Dean, Captain Preston DeJean awarded Academic Gold and Silver Stars for the First Term of Academic Year 2018 and Sea Year Ribbons for demonstrated excellence at sea during Class of 2017 B-split term. On November 11th, the USMMA football team defeated arch-rival Coast Guard, 48-23, on Saturday afternoon in the annual Secretaries' Cup Game up at the Bears' Cadet Memorial Stadium. The game was broadcasted live and streamed on ESPN3 as part of ESPN's week-long celebration of Veterans Day. This is the Merchant Marine's third-straight Secretaries' Cup win and 25th all-time since it was established in 1981.